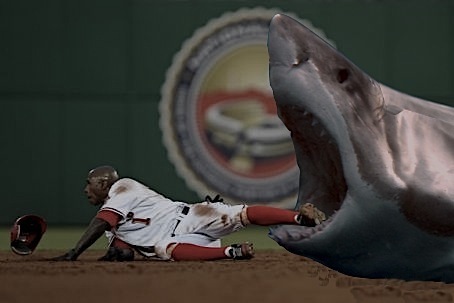 The Sharkadina Blog: Shark Bites Nyjer Morgan! THIS IS EXACTLY WHY HE IS THE SHARK. Number 3 Play on SportsCenter Top Ten! Sorry Nyjer, but you should know best of all to not hit to CF when there is a hungry shark out there. Nyjer was there when we nicknamed Bernadina and even encouraged the nickname. Now he was bitten by the very Shark he helped create. Ironic? Tragic? No, just Jawesome. Shark and Nyjer have a long history of competetion. Last spring they competed for the starting CF position before Nyjer was traded to the Brewers. You can see our coverage of the battle, their Shark riding contest, and Shark giving Nyjer a lift to Milwaukee (in his jaws). But basically, this image sums of Shark's superiority that we all saw demonstrated last night.